Atman is one of the most well-known lecturers on the Assyrian Genocide. He was born in Nsibin (Tur Abdin) in southeast Turkey, moved to Austria due to political reasons, and to Sweden five years later. 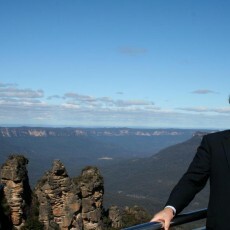 He has studied economics at the University of Gothenburg and has a master’s degree on human rights and genocide studies from Kingston University in London, Siena University in Italy, and Warsaw University in Poland. Atman continues to contribute immensely to worldwide awareness of the Assyrian Genocide. He is currently a doctoral student in genocide studies at Clark University in Worcester, Mass. 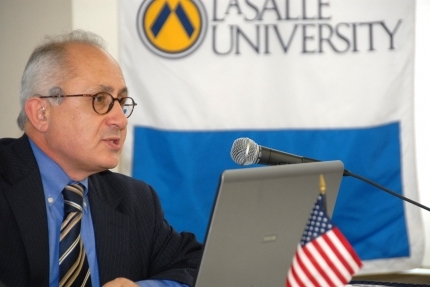 His dissertation is on the Assyrian Genocide and the involvement of the Kurds. Varak Kestsemanian—What is the primary sequence of events that constitute the Assyrian Genocide? Sabri Atman—We Assyrians call the genocide of 1915 Seyfo, meaning “the sword.” The reason we called it the sword was that the perpetrators were using Seyfo as a weapon for the killings. Seyfo is a term that seeks to highlight the Assyrian share of the genocide, perpetrated against the Armenians and Greeks as well, during the First World War. The genocide that wiped out more than half the population of the Assyrians took place mainly in southeastern Turkey, but also in the northwestern town of Urmiya in Iran. The Assyrians initially put the number of their victims at 250,000 people in both the Turkish territories and Urmiya, Iran. But, the Assyrian delegation to the Lausanne peace talks of 1923 presented the number of victims as 275,000, since they had collected more information on the numbers of those who perished. But, according to some scholars, up to 400,000 civilian Assyrians perished in the systematic killings, which were ordered and carried out by the Ottoman state, with the collaboration of its Kurdish subjects and with troops and divisions of the regular Ottoman military and police forces combined. The 1915 genocide did not target only the Armenians but also the Greeks, Assyrians, and the Ezidis. The strategy that the perpetrators had in mind was ethnically annihilating all non-Muslim citizens living under the Ottoman occupation, with the objective of homogenizing Turkey in accordance with their goal to create a nation of “One Religion.” Indeed, their motto was “One Nation, One Religion.” To achieve their goal, jihad (or holy war) was declared on Nov. 14, 1914 in all of the Ottoman mosques. Jihad was declared against all Christian subjects living within the Ottoman territories without having a particular victim. The main plot was to get rid of all the Christian minorities of Turkey. The execution of their primary plan to create one Muslim-Turkish nation started with attempts to assimilate the non-Turkish Muslim populations like the Kurds and other immigrants from the Balkans. These Muslim groups were relocated to such cities as Ankara, Adana, and Konya, and spread among the Turkish majority. The next step was the removal of the non-Muslim groups from Turkey. Two million Christian (mainly Armenians, Assyrians, and Greeks) were massacred, starved to death and deported as a result of that policy. V.K.—How does the Assyrian Genocide differ from the massacres perpetrated against the Greeks and Armenians? S.A.—The witnesses I’ve interviewed all have wanted to clarify that neither the architects nor the perpetuators [of the genocide] made any distinction between any ethnic Christians. They were claiming that “An onion is an onion, whether it’s red or white. All must be chopped!” This was a direct reference to the planned and calculated slaughter of the Assyrian, Armenian, and Greek Christians. While a large number of Armenians died during the deportation, many Assyrians were killed in their villages and towns. V.K.—What are the primary sources that make up the research material for your dissertation? S.A.—The primary sources for my research are the oral testimonies of the events, which I’ve collected over the past decade. These sources include unpublished interviews—that I and many other people conducted with survivors of the genocide—which we will transcribe, translate, and put into both historical and socio-political context. Most of the sources addressing and documenting the Assyrian Genocide are scattered and written in languages that are not easily accessible to genocide scholars. These sources are either written in Assyrian, Arabic, or Turkish. Furthermore, oral history and testimonies are entirely ignored by academia since most scholars concerned with the 1915 genocide have little knowledge of the Assyrian language. However, these oral testimonies of genocide survivors are central and immensely important, as they can shed light on many opaque aspects of the Assyrian Genocide. These oral testimonies represent an extensive pool of information ready to be subjected to academic scrutiny. Although the written sources are of paramount importance, they have not yet been translated to modern European languages, rendering them inaccessible to most genocide studies scholars. To mention a few, they include Isaac Armalto’s eye-witness account that he published in Arabic in 1919 in Lebanon; and Mar Israel Audo’s documentation of the tragedies, which is available in an unpublished manuscript in Assyrian. Many of our oral history documentations gathered at the Seyfo Center are first-hand testimonies of eye-witness accounts. I had the opportunity to interview and record many survivors, and they not only provided me with valuable information then, but their testimonies continue to provide me with an endless moral boost in what I do. –American Ambassador Henry Morgenthau, Jr. in Constantinople gave reports about his contacts with the government of the Young Turks. –A document was published already in 1916 entitled “The Treatment of Armenians in the Ottoman Empire, 1915-1916” by James Bryce, a British expert in political science, and Arnold Toynbee, a historian. Over 100 pages of this document are about the Assyrians. –Johannes Lepsius, a German missionary who lived in Anatolia, informed the authorities in Berlin about what was happening at the time. The documentation was published in 1919 in Potsdam. –Prof. David Gaunt together with Dr. Racho Donef published the book Massacres, Resistance, Protectors in 2006 and covers the fate of all the Christian groups of eastern Anatolia during World War I.
V.K.—What is the primary function of the Seyfo Center? How does it contribute to genocide scholarship? S.A.—The Seyfo Center has a big pool of sources and provides research assistance to scholars, writers, journalists, filmmakers, and government agencies. We also document the Assyrian Genocide by collecting oral histories and publishing written evidence; presenting the Assyrian Genocide in parliaments and government bodies; educating non-Assyrians in political and academic forums; participating in activism on behalf of [recognition of] the Assyrian Genocide; and publishing books, reports, brochures, and other media. We lobby [for recognition]. –On May 13, 2009, a press conference took place in the Swedish Parliament. A Kurdish intellectual called Berzan Boti apologized for the genocide of 1915 and, as an act of restitution, handed back his property to its rightful owners, Assyrians. The deeds of his property were then transferred to the Seyfo Center. –On March 10, 2010, the Swedish Parliament recognized the Assyrian Genocide. 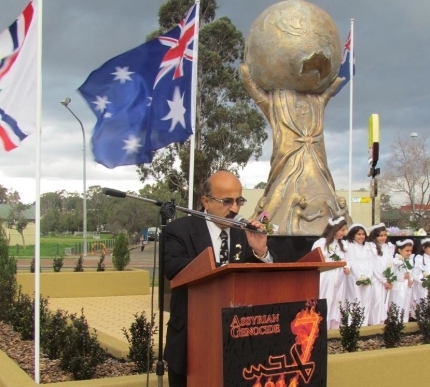 –Thanks to the Assyrian Universal Alliance (AUA) and the efforts by the Assyrians in Australia, a monument was erected on Aug. 7, 2010, for the Assyrian victims during World War I and the Simele Massacre. –On May 1, 2013, the Australian Parliament of New South Wales (NSW) recognized the Assyrian and the Greek Genocide. –On April 25, 2012, the Assyrian Genocide Monument was unveiled in capital city of Armenia, in Yerevan. –On April 27, 2013, the third Assyrian genocide monument was unveiled in France. I am sure that in the very near future, we will have more monuments erected around the world, and the number of countries who recognize the Assyrian Genocide will have increased dramatically. V.K.—What are the primary demands of the Assyrian people from the Turkish government? S.A.—First of all, we want the Republic of Turkey to stop the lies they have been practicing now for 98 years and recognize the Assyrian, Armenian, and Greek genocides. Denial is a form of continuation of the genocide. It is to be killed twice. Failure to recognize the genocide has led to even more genocides against Assyrians in their homeland. We Assyrians also don’t understand the fact that the Republic of Armenia has not recognized the Assyrian Genocide yet. Today, I am very happy that so far about 26 countries have officially recognized the 1915 Armenian Genocide. March 10, 2010 and May 1, 2013 are historical days especially for us as Assyrians and Greeks. The Swedish and Australian Parliaments passed a resolution and recognized the Assyrian and Greek Genocides in addition to the Armenian Genocide. I hope other countries will follow suit. Our Armenian friends living in Armenia and around the world have to help us and add the Assyrian and Greek Genocides on the international agenda. Remember: Assyrians and Greeks were subjected to the genocide in Turkey, too. We also demand that today the whole world officially recognize this fact. Of course, the Republic of Armenia, for many reasons should be one of the first countries in the world to recognize the Assyrian Genocide! We are would very much like to have a strategy based on friendship between Armenians, Assyrians, and Greeks. We, who were subjected to the same genocide, should finds ways and means of an internal dialogue and then speak with one voice.